Forget the temperature, forget the mosquito’s and the rain even. There is a natural draw to fire we all find irresistible and when we gather there no matter how big or small it doesn’t take long for a story to start. 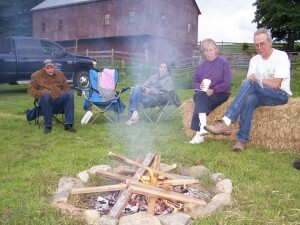 This particular fire is at Blue Slope Farm Museum, Franklin Ct. http://www.blueslope.com/ The Staebner Family at Blue Slope know a thing or two about family time, country living and simple pleasures. From campfires and stories, square dances in the barn ( see pic) to hay rides pulled by a team of draft horses, all reminiscent of the past and wonderfully fulfilling today! Oct. 2-3, 2010 will be the annual Fall Festival on the Farm. The museum will be open, the hayrides meandering through cornfields recently harvested and the kids face first into a pie eating contest. Great steaming hot baked potatoes will be served up and Boy Scouts and farmers, families and business people will all slow down long enough to take in the scent of fall on the farm. Blue Hill Farm, just up the road will have donkey demonstrations and a donkey show going on at the event. All the long ears will be showing how generous in spirit they are as they drive carts, jumps through obstacles, endure and love being petted and fawned over by all the children and show their ” All Ears ” when it comes time for the end of the day stories. Members of Eastern Ct. Draft horse Club will be out in the field doing demonstrations of plowing with the gentle giants. The horses will do wagon rides as well as work demonstrations. http://www.easternctdrafthorse.com/ You wont want to miss the Fall Festival when all these great things can be seen on one active dairy farm. You may even be asked to coax some milk from one of the beauties! The events your family shares this Fall will be the stories to tell around the fire this winter, when the wind swings round from the North and blows hard and cold on us. In the meantime go on out and make some great memories. The night this picture was taken I was sharing some of my stories at the campfire and had to share some good horse tales. Better gather some wood must be time for more stories!